Family Friendly 5 bedroom home with a private pool! Looking for a family getaway? Well, look no further than 3 Palm Court! Located in the heart of the Isle of Palms, and just 20 minutes from historic Charleston, this 5 bedroom, 3.5 bath rental is perfect for any large group of travelers. Situated on a small cul-de-sac just off Palm Boulevard, this house sports a modern beach style design. Walk up and take notice of the spacious wrap-around porch with outdoor seating and private pool. Sit back and relax while taking in the ocean breeze or take a dip in the pool. Enter the home and enjoy the open floor plan. There is plenty of room for everyone to gather around but also find some privacy in the expansive house. The living room has simple yet modern decor with two comfortable couches and extra seating for everyone to gather around the flat-screen TV. The dining area is situated close by with seating for 7 around the dining table, plus three additional bar stools if needed. Both the living room and dining areas access the outside deck. The kitchen is well equipped with everything a guest could need and is ideal for entertaining. The highlights include a large central island with a wine cooler, upgraded cabinetry, modern stainless appliances, and beautiful granite countertops. The second floor consists of 3 bedrooms. The first room is the spacious master suite (Bedroom 1). It is equipped with a king size bed, large flat-screened TV, and a sofa for added seating. It has a private bathroom with dual vanity and updated countertops as well as a stand alone shower and shower/tub combination. The second and third bedrooms (Bedrooms 2 and 3) consist of two queen beds and two twin beds respectively, and both have TVs. Just off the hallway between these two bedrooms is a full shared bathroom with a combination shower/tub. Halfway up to the third floor is a bonus living room with a pull-out couch and flat-screen TV to provide additional sleeping place or a spot to lounge and watch a movie. This added living space has access to the roof top deck, which is a great outdoor spot to take in the ocean breeze and enjoy the sun. The third floor contains the last two bedrooms (Bedrooms 4 and 5). The fourth bedroom contains a king bed and the fifth has two queen beds. They both have their own TV and share the hall access bathroom. The home is equipped with WiFi, full-size washer and dryer, and there is an added half bathroom on the first floor. The perfect beach vacation is just a few clicks away! 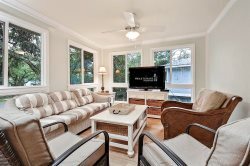 Come enjoy this wonderful family-friendly beach house located a 3 Palm Court!